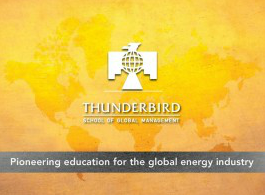 Refine your oil & gas management skills for global success through this unique online certificate & with Thunderbird Online's global corporate solutions. Thunderbird Online’s Certificate in Global Oil & Gas Management is designed to provide you with a well-rounded, global understanding of the ever-changing oil and gas industry. Management styles and strategies in the global oil and gas industry are in constant flux. In this era of increased industry consolidation and heightened competition, the dynamics of international business are in full force. Thunderbird Online's Certificate in Global Oil & Gas Management focuses on the business of the Upstream, Midstream and Downstream segments of the industry. Your certificate is comprised of 12 modules developed by Thunderbird faculty, and delivered via the Thunderbird learning environment. Each module runs approximately 120 minutes. Provide your employees with a global oil & gas business education on your schedule. Thunderbird Online’s Certificate in Global Oil & Gas Management is designed to provide your team with a well-rounded, global understanding of the ever-changing oil and gas industry. This certificate will focus on the Upstream, Midstream and Downstream segments of the industry, and go into detail on financial management, product management, the refining process and the future of the oil and gas industry. Have questions about Thunderbird's professional development for your organization? Contact your Client Relationship Specialist today. Schedule a 15-minute online demonstration with a Thunderbird Online Enrollment Counselor. 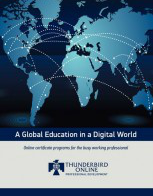 Learn more about Thunderbird Online's history, programs, delivery method, and global faculty. Enter your contact information to be notified of new course offerings.